A single (usually optional) numeric parameter, composed of one of more digits. A multiple numeric parameter composed of any number of single numeric parameters, separated by ; character(s). Individual values for the parameters are listed with P s .
A text parameter composed of printable characters. Return Terminal ID (DECID is 0x9a). Obsolete form of CSI c (DA). These control characters are used in the vtXXX emulation. Most of these control sequences are standard VT102 control sequences, but there is support for later DEC VT terminals (i.e., VT220, VT320, VT420), as well as ISO 6429 and aixterm color controls. The only VT102 features not supported is auto-repeat, since the only way X provides for this will affect all windows. There are additional control sequences to provide xterm-dependent functions, such as the scrollbar or window size. Where the function is specified by DEC or ISO 6429, the code assigned to it is given in parentheses. The escape codes to designate and invoke character sets are specified by ISO 2022; see that document for a discussion of character sets. Return Terminal Status (Ctrl-E). Default response is an empty string, but may be overridden by a resource answerbackString. Shift Out (Ctrl-N) → Switch to Alternate Character Set: invokes the G1 character set. Shift In (Ctrl-O) → Switch to Standard Character Set: invokes the G0 character set (the default). Controls beginning with ESC (other than those where ESC is part of a 7-bit equivalent to 8-bit C1 controls), ordered by the final character(s). Set ANSI conformance level 1 (dpANS X3.134.1). Set ANSI conformance level 2 (dpANS X3.134.1). Set ANSI conformance level 3 (dpANS X3.134.1). Cursor to lower left corner of screen (if enabled by the hpLowerleftBugCompat resource). Memory Lock (per HP terminals). Locks memory above the cursor. Invoke the G2 Character Set as GL (LS2). Invoke the G3 Character Set as GL (LS3). Invoke the G3 Character Set as GR (LS3R). Invoke the G2 Character Set as GR (LS2R). Invoke the G1 Character Set as GR (LS1R). xterm implements no APC functions; P t is ignored. P t need not be printable characters. P s = 1 → Do not lock. The third parameter is a ’;’-separated list of strings denoting the key-code separated by a ’/’ from the hex-encoded key value. The key codes correspond to the DEC function-key codes (e.g., F6=17). xterm responds with DCS 1 $ r P t ST for valid requests, replacing the P t with the corresponding CSI string, or DCS 0 $ r P t ST for invalid requests. Request Termcap/Terminfo String (xterm, experimental). 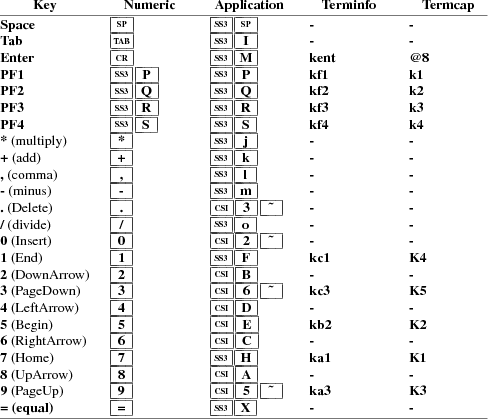 The string following the "q" is a list of names encoded in hexadecimal (2 digits per character) separated by ; which correspond to termcap or terminfo key names. xterm responds with DCS 1 + r P t ST for valid requests, adding to P t an = , and the value of the corresponding string that xterm would send, or DCS 0 + r P t ST for invalid requests. The strings are encoded in hexadecimal (2 digits per character). Initiate highlight mouse tracking. Parameters are [func;startx;starty;firstrow;lastrow]. See the section Mouse Tracking. P s = 0 or omitted → request attributes from terminal. The response depends on the decTerminalID resource setting. P s = 0 or omitted → request the terminal’s identification code. The response depends on the decTerminalID resource setting. It should apply only to VT220 and up, but xterm extends this to VT100. and P v is the firmware version (for xterm, this is the XFree86 patch number, starting with 95). In a DEC terminal, P c indicates the ROM cartridge registration number and is always zero. 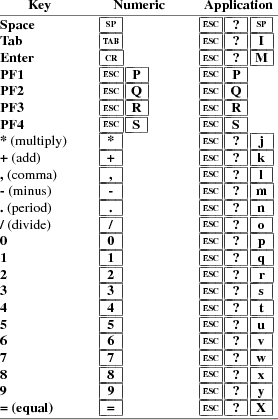 P s = 2 → Designate USASCII for character sets G0-G3 (DECANM), and set VT100 mode. P s = 9 → Send Mouse X & Y on button press. See the section Mouse Tracking. P s = 3 0 → Show scrollbar (rxvt). P s = 3 5 → Enable font-shifting functions (rxvt). P s = 1 0 0 0 → Send Mouse X & Y on button press and release. See the section Mouse Tracking. P s = 1 0 0 1 → Use Hilite Mouse Tracking. P s = 1 0 0 2 → Use Cell Motion Mouse Tracking. P s = 1 0 0 3 → Use All Motion Mouse Tracking. P s = 1 0 1 0 → Scroll to bottom on tty output (rxvt). P s = 1 0 1 1 → Scroll to bottom on key press (rxvt). P s = 1 0 3 5 → Enable special modifiers for Alt and NumLock keys. P s = 1 0 3 6 → Send ESC when Meta modifies a key (enables the metaSendsEscape resource). P s = 1 0 4 9 → Save cursor as in DECSC and use Alternate Screen Buffer, clearing it first (unless disabled by the titeInhibit resource). This combines the effects of the 1 0 4 7 and 1 0 4 8 modes. Use this with terminfo-based applications rather than the 4 7 mode. P s = 1 0 5 1 → Set Sun function-key mode. P s = 1 0 5 2 → Set HP function-key mode. P s = 1 0 5 3 → Set SCO function-key mode. P s = 1 0 6 0 → Set legacy keyboard emulation (X11R6). P s = 1 0 6 1 → Set Sun/PC keyboard emulation of VT220 keyboard. P s = 2 0 0 4 → Set bracketed paste mode. P s = 2 → Designate VT52 mode (DECANM). P s = 3 0 → Don’t show scrollbar (rxvt). P s = 3 5 → Disable font-shifting functions (rxvt). P s = 1 0 0 0 → Don’t Send Mouse X & Y on button press and release. See the section Mouse Tracking. P s = 1 0 1 0 → Don’t scroll to bottom on tty output (rxvt). P s = 1 0 1 1 → Don’t scroll to bottom on key press (rxvt). P s = 1 0 3 5 → Disable special modifiers for Alt and NumLock keys. P s = 1 0 3 6 → Don’t send ESC when Meta modifies a key (disables the metaSendsEscape resource). P s = 1 0 4 9 → Use Normal Screen Buffer and restore cursor as in DECRC (unless disabled by the titeInhibit resource). This combines the effects of the 1 0 4 7 and 1 0 4 8 modes. Use this with terminfo-based applications rather than the 4 7 mode. P s = 1 0 5 1 → Reset Sun function-key mode. P s = 1 0 5 2 → Reset HP function-key mode. P s = 1 0 5 3 → Reset SCO function-key mode. P s = 1 0 6 0 → Reset legacy keyboard emulation (X11R6). P s = 1 0 6 1 → Reset Sun/PC keyboard emulation of VT220 keyboard. P s = 2 0 0 4 → Reset bracketed paste mode. P s = 4 9 → Set background color to default (original). If 88- or 256-color support is compiled, the following apply. P s = 6 → Report Cursor Position (CPR) [row;column] as CSI ? r ; c R (assumes page is zero). The last two parameters apply to VT400 & up, and denote keyboard ready and LK01 respectively. CSI ? 5 0 n No Locator, if not. Restore DEC Private Mode Values. The value of P s previously saved is restored. P s values are the same as for DECSET. Change Attributes in Rectangular Area (DECCARA). P t ; P l ; P b ; P r denotes the rectangle. Save DEC Private Mode Values. P s values are the same as for DECSET. P s = 1 → De-iconify window. P s = 2 → Iconify window. P s = 3 ; x ; y → Move window to [x, y]. P s = 4 ; height ; width → Resize the xterm window to height and width in pixels. P s = 5 → Raise the xterm window to the front of the stacking order. P s = 6 → Lower the xterm window to the bottom of the stacking order. P s = 7 → Refresh the xterm window. P s = 8 ; height ; width → Resize the text area to [height;width] in characters. P s = 9 ; 0 → Restore maximized window. P s = 9 ; 1 → Maximize window (i.e., resize to screen size). P s = 1 1 → Report xterm window state. If the xterm window is open (non-iconified), it returns CSI 1 t . If the xterm window is iconified, it returns CSI 2 t .
Reverse Attributes in Rectangular Area (DECRARA). P p denotes the source page. P t ; P l denotes the target location. P p denotes the target page. Defines the coordinates of a filter rectangle and activates it. Anytime the locator is detected outside of the filter rectangle, an outside rectangle event is generated and the rectangle is disabled. Filter rectangles are always treated as "one-shot" events. Any parameters that are omitted default to the current locator position. If all parameters are omitted, any locator motion will be reported. DECELR always cancels any prevous rectangle definition. P s → the given P s incremented by 2. Select Attribute Change Extent (DECSACE). P s = 2 → rectangle (exact). P c is the character to use. The second parameter specifies the coordinate unit for locator reports. Selective Erase Rectangular Area (DECSERA). If Locator Reporting has been enabled by a DECELR, xterm will respond with a DECLRP Locator Report. This report is also generated on button up and down events if they have been enabled with a DECSLE, or when the locator is detected outside of a filter rectangle, if filter rectangles have been enabled with a DECEFR. ‘‘row’’ and ‘‘column’’ parameters are the coordinates of the locator position in the xterm window, encoded as ASCII decimal. The ‘‘page’’ parameter is not used by xterm, and will be omitted. Set Text Parameters. For colors and font, if P t is a "? ", the control sequence elicits a response which consists of the control sequence which would set the corresponding value. The dtterm control sequences allow you to determine the icon name and window title. P s = 4 ; c ; spec → Change Color Number c to the color specified by spec, i.e., a name or RGB specification as per XParseColor. Any number of c name pairs may be given. The color numbers correspond to the ANSI colors 0-7, their bright versions 8-15, and if supported, the remainder of the 88-color or 256-color table. If a "?" is given rather than a name or RGB specification, xterm replies with a control sequence of the same form which can be used to set the corresponding color. Because more than one pair of color number and specification can be given in one control sequence, xterm can make more than one reply. The 8 colors which may be set using 1 0 through 1 7 are denoted dynamic colors, since the corresponding control sequences were the first means for setting xterm’s colors dynamically, i.e., after it was started. They are not the same as the ANSI colors. One or more parameters is expected for P t . Each successive parameter changes the next color in the list. The value of P s tells the starting point in the list. The colors are specified by name or RGB specification as per XParseColor. If a "?" is given rather than a name or RGB specification, xterm replies with a control sequence of the same form which can be used to set the corresponding dynamic color. Because more than one pair of color number and specification can be given in one control sequence, xterm can make more than one reply. P s = 5 0 → Set Font to P t If P t begins with a "#", index in the font menu, relative (if the next character is a plus or minus sign) or absolute. A number is expected but not required after the sign (the default is the current entry for relative, zero for absolute indexing). The first, P c , may contain any character from the set c p s 0 1 2 3 4 5 6 7 . It is used to construct a list of selection parameters for clipboard, primary, select, or cut buffers 0 through 8 respectively, in the order given. If the parameter is empty, xterm uses s 0 , to specify the configurable primary/clipboard selection and cut buffer 0. The second parameter, P d , gives the selection data. Normally this is a string encoded in base64. The data becomes the new selection, which is then available for pasting by other applications. If the second parameter is a ? , xterm replies to the host with the selection data encoded using the same protocol. xterm implements no PM functions; P t is ignored. P t need not be printable characters. If xterm does minimal translation of the function keys, it usually does this with a PC-style keyboard, so PC-style function keys result. Sun keyboards are similar to PC keyboards. Both have cursor and scrolling operations printed on the keypad, which duplicate the smaller cursor and scrolling keypads. X does not predefine NumLock (used for VT220 keyboards) or Alt (used as an extension for the Sun/PC keyboards) as modifiers. These keys are recognized as modifiers when enabled by the numLock resource, or by the DECSET 1 0 3 5 control sequence. 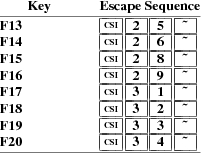 The cursor keys transmit the following escape sequences depending on the mode specified via the DECCKM escape sequence. The application keypad transmits the following escape sequences depending on the mode specified via the DECPNM and DECPAM escape sequences. Use the NumLock key to override the application mode. Not all keys are present on the Sun/PC keypad (e.g., PF1, Tab), but are supported by the program. They also provide 12 function keys, as well as a few other special-purpose keys. Older versions of xterm implement different escape sequences for F1 through F4. These can be activated by setting the oldXtermFKeys resource. However, since they do not correspond to any hardware terminal, they have been deprecated. (The DEC VT220 reserves F1 through F5 for local functions such as Setup). In normal mode, i.e., a Sun/PC keyboard when the sunKeyboard resource is false, xterm recognizes function key modifiers which are parameters appended before the final character of the control sequence. If the alwaysUseMods resource is set, the Meta modifier also is recognized, making parameters 9 through 16. However, xterm is most useful as a DEC VT102 or VT220 emulator. Set the sunKeyboard resource to true to force a Sun/PC keyboard to act like a VT220 keyboard. The VT220 provides 8 additional function keys. With a Sun/PC keyboard, access these keys by Control/F1 for F13, etc. The xterm program provides support for Sun keyboards more directly, by a menu toggle that causes it to send Sun-style function key codes rather than VT220. Note, however, that the sun and VT100 emulations are not really compatible. For example, their wrap-margin behavior differs. Only function keys are altered; keypad and cursor keys are the same. The emulation responds identically. See the xterm-sun terminfo entry for details. Similarly, xterm can be compiled to support HP keyboards. See the xterm-hp terminfo entry for details. Xterm maintains two screen buffers. The normal screen buffer allows you to scroll back to view saved lines of output up to the maximum set by the saveLines resource. The alternate screen buffer is exactly as large as the display, contains no additional saved lines. When the alternate screen buffer is active, you cannot scroll back to view saved lines. Xterm provides control sequences and menu entries for switching between the two. Most full-screen applications use terminfo or termcap to obtain strings used to start/stop full-screen mode, i.e., smcup and rmcup for terminfo, or the corresponding ti and te for termcap. The titeInhibit resource removes the ti and te strings from the TERMCAP string which is set in the environment for some platforms. That is not done when xterm is built with terminfo libraries because terminfo does not provide the whole text of the termcap data in one piece. It would not work for terminfo anyway, since terminfo data is not passed in environment variables; setting an environment variable in this manner would have no effect on the application’s ability to switch between normal and alternate screen buffers. Instead, the newer private mode controls (such as 1 0 4 9 ) for switching between normal and alternate screen buffers simply disable the switching. They add other features such as clearing the display for the same reason: to make the details of switching independent of the application that requests the switch. When bracketed paste mode is set, pasted text is bracketed with control sequences so that the program can differentiate pasted text from typed-in text. When bracketed paste mode is set, the program will receive: ESC [ 200 ~, followed by the pasted text, followed by ESC [ 201 ~. The VT widget can be set to send the mouse position and other information on button presses. These modes are typically used by editors and other full-screen applications that want to make use of the mouse. There are six mutually exclusive modes. One is DEC Locator mode, enabled by the DECELR CSI P s ; P s ´z control sequence, and is not described here (control sequences are summarized above). The remaining five modes are each enabled (or disabled) by a different parameter in DECSET CSI ? P m h or DECRST CSI ? P m l control sequence. The motion reporting modes are strictly xterm extensions, and are not part of any standard, though they are analogous to the DEC VT200 DECELR locator reports. Parameters (such as pointer position and button number) for all mouse tracking escape sequences generated by xterm encode numeric parameters in a single character as value+32. For example, ! specifies the value 1. The upper left character position on the terminal is denoted as 1,1. X10 compatibility mode sends an escape sequence only on button press, encoding the location and the mouse button pressed. It is enabled by specifying parameter 9 to DECSET. On button press, xterm sends CSI M C b C x C y (6 characters). C b is button−1. C x and C y are the x and y coordinates of the mouse when the button was pressed. Normal tracking mode sends an escape sequence on both button press and release. Modifier key (shift, ctrl, meta) information is also sent. It is enabled by specifying parameter 1000 to DECSET. On button press or release, xterm sends CSI M C b C x C y . The low two bits of C b encode button information: 0=MB1 pressed, 1=MB2 pressed, 2=MB3 pressed, 3=release. The next three bits encode the modifiers which were down when the button was pressed and are added together: 4=Shift, 8=Meta, 16=Control. Note however that the shift and control bits are normally unavailable because xterm uses the control modifier with mouse for popup menus, and the shift modifier is used in the default translations for button events. The Meta modifier recognized by xterm is the mod1 mask, and is not necessarily the "Meta" key (see xmodmap). C x and C y are the x and y coordinates of the mouse event, encoded as in X10 mode. Wheel mice may return buttons 4 and 5. Those buttons are represented by the same event codes as buttons 1 and 2 respectively, except that 64 is added to the event code. Release events for the wheel buttons are not reported. Mouse highlight tracking notifies a program of a button press, receives a range of lines from the program, highlights the region covered by the mouse within that range until button release, and then sends the program the release coordinates. It is enabled by specifying parameter 1001 to DECSET. Highlighting is performed only for button 1, though other button events can be received. Warning: use of this mode requires a cooperating program or it will hang xterm. On button press, the same information as for normal tracking is generated; xterm then waits for the program to send mouse tracking information. All X events are ignored until the proper escape sequence is received from the pty: CSI P s ; P s ; P s ; P s ; P s T . The parameters are func, startx, starty, firstrow, and lastrow. func is non-zero to initiate highlight tracking and zero to abort. startx and starty give the starting x and y location for the highlighted region. The ending location tracks the mouse, but will never be above row firstrow and will always be above row lastrow. (The top of the screen is row 1.) When the button is released, xterm reports the ending position one of two ways: if the start and end coordinates are valid text locations: CSI t C x C y . If either coordinate is past the end of the line: CSI T C x C y C x C y C x C y . The parameters are startx, starty, endx, endy, mousex, and mousey. startx, starty, endx, and endy give the starting and ending character positions of the region. mousex and mousey give the location of the mouse at button up, which may not be over a character. Button-event tracking is essentially the same as normal tracking, but xterm also reports button-motion events. Motion events are reported only if the mouse pointer has moved to a different character cell. It is enabled by specifying parameter 1002 to DECSET. On button press or release, xterm sends the same codes used by normal tracking mode. On button-motion events, xterm adds 32 to the event code (the third character, C b ). The other bits of the event code specify button and modifier keys as in normal mode. For example, motion into cell x,y with button 1 down is reported as CSI M @ C x C y . ( @ = 32 + 0 (button 1) + 32 (motion indicator) ). Similarly, motion with button 3 down is reported as CSI M B C x C y . ( B = 32 + 2 (button 3) + 32 (motion indicator) ). Any-event mode is the same as button-event mode, except that all motion events are reported, even if no mouse button is down. It is enabled by specifying 1003 to DECSET. Most of these sequences are standard Tektronix 4014 control sequences. Graph mode supports the 12-bit addressing of the Tektronix 4014. The major features missing are the write-through and defocused modes. This document does not describe the commands used in the various Tektronix plotting modes but does describe the commands to switch modes. Parameters for cursor movement are at the end of the ESC Y escape sequence. Each ordinate is encoded in a single character as value+32. For example, ! is 1. The screen coordinate system is 0-based. Move the cursor to the home position. Erase from the cursor to the end of the screen. Erase from the cursor to the end of the line. Move the cursor to given row and column. Exit VT52 mode (Enter VT100 mode).